Will you take the pledge to celebrate Buy Nothing Day? What do the holidays mean to you? If you take a second to close your eyes and picture the holiday season you will likely be thinking of hearty dinners, holiday parties, and spending time with your family to focus on the blessings you enjoy. Our most cherished holiday memories come from enjoying what we have with those we love. However, while being content is wonderful for our sanity, it's a major problem for retailers. Large corporations are telling their own holiday stories, ones in which we express our love not by doing stuff with our families, but by buying Stuff for them. The holidays aren’t about friends dropping in, but shopping ‘til you drop. Of course we can buy gifts for those we love! But we can’t allow commercialism to take over the holidays. That's why we are inviting you to join us in celebrating Buy Nothing Day, an international holiday dedicated to resisting consumerism. First organized in 1992, Buy Nothing Day has spread to 65 countries around the globe. In the US, it takes on the largest "consumer holiday," Black Friday. And this year, globally, this day is also celebrated on Friday, November 24th. Participation has grown every year as people see commercialism creeping further and further into our lives, making the holidays a time of stress and anxiety. 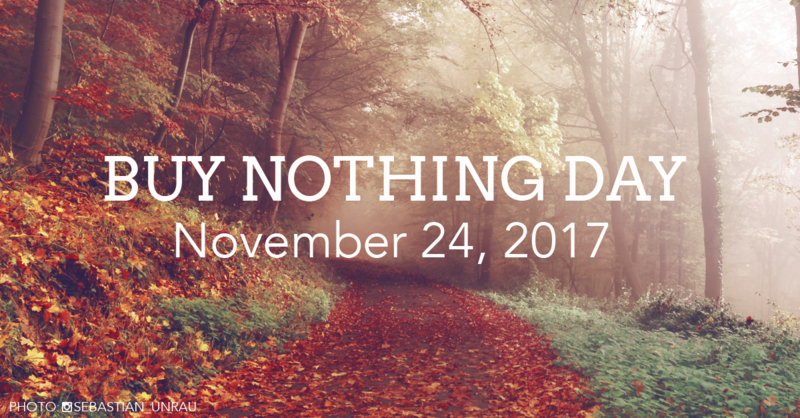 By celebrating Buy Nothing Day, we take the pressure off retailers to force employees to work overtime, and we help reclaim the holidays as a time to rest and to strengthen our social bonds. If we each do our part, then together we can tell a better story. We can generate cherished memories instead of contributing to stress and crowded malls. We can celebrate the true meaning of the holidays. Are you ready to join us?